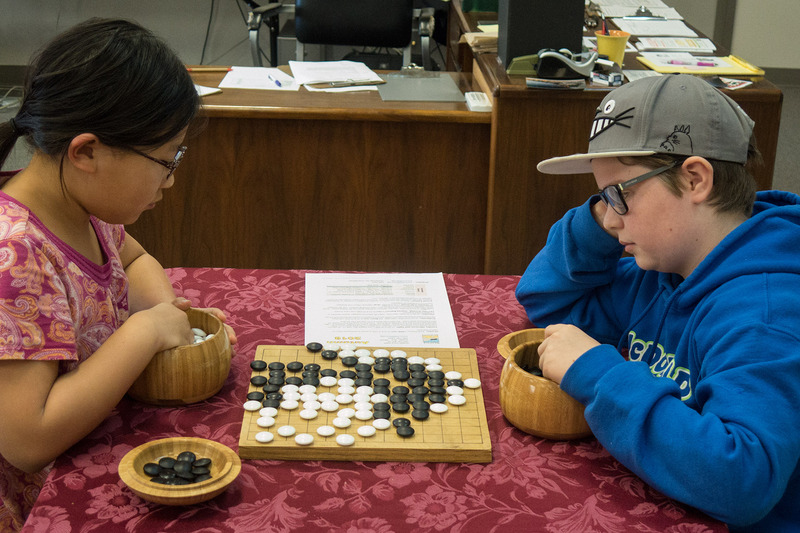 Beginning December 12, 2018, the Go Center is closed on Wednesdays (due to recent low turnout, expected to be exacerbated by the winter holidays). Regularly scheduled Wednesday operations will resume January 16, 2019, with interesting new classes — announcement coming soon. Seattle Go Center has library of books, magazines, and other media available for members to use. There are materials in English, Japanese, Korean, and Chinese. Some of these items (the ones for which we have duplicates) can be checked out for a period of a month by any youth member or any paying member. Frank Brown has recently completed a volunteer project to catalogue the portion of the library available for lending. See sgc-lending-library for the catalogue. Gala Pair Go Tournament Dec. 8 With Haylee! * Saturday, December 8 (following 2nd Saturday Speed League). * Register in person, 5:00 – 5:30 PM. * $10 entry ($5 for youth 17 and younger / Go Center voting members). 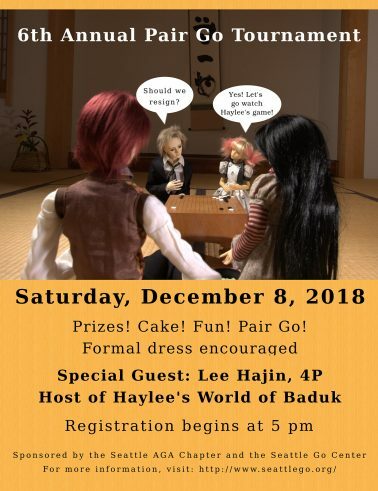 This is a great holiday event, with two rounds of Pair Go, cake, prizes and lots of fun. (We expect to finish the evening around 10 PM.) We will be following International Pair Go Rules. Each team must have one male partner, and one female, transgender, or non-binary partner. Team members may be of any age. This is not an official Pair Go competition, so formal dress is encouraged, but not required. Special guest Hajin Lee, 4 Dan professional — Haylee’s World of Go/Baduk — is expected to play! 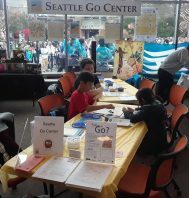 Sunday November 18, 2018, Seattle Go Center held our annual Fall Youth Tournament. It was a fun event where the kids could choose whether to play their games on 19×19 or 13×13. Eight kids played three rounds on 19×19, and thirteen played four rounds on 13×13. For most of them, it was their first tournament ever. The youngest player was in preschool! The oldest players were in 7th grade. Deep thanks go to Sonny Cho, Peter Kron, and Brian Allen for making it smooth and satisfying; also to the families who make it possible for their kids to play! We have a few changes at the Go Center this week to accommodate the Thanksgiving holiday. – Open as usual Monday (6:30-8:30 PM) and Tuesday (1:00-10:00 PM). – Closed Thursday (which is Thanksgiving). – Closed as usual Friday. – Regular hours Saturday (Michael Brown will cover for Dennis Wheeler). – Wednesday Uwajimaya Go meetup is canceled ahead of Thanksgiving. – Thursday Go meetup at Hurry Curry is canceled, because the restaurant is closed for Thanksgiving. – Thursday Go meetup at Couth Buzzard is canceled, because they are closed for Thanksgiving. Thanks to the volunteer efforts of Frank Brown, the items in the Go Center’s lending library are now listed online! Paying members (Lifetime, Annual, Quarterly, or Ten-Visits Card) members may borrow up to two books at a time, for up to a month. Check with the Day Manager to sign a book out. Click the top of a column to sort by that column. Click again to reverse the order. The lending library catalogue is a work in progress. There are plans to add keywords like “tsumego” and “beginner” to roughly group books by subject. 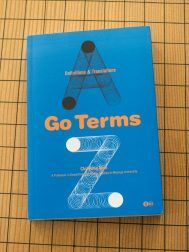 We have gotten a second shipment of Chihyung Nam’s new book, “Go Terms”. 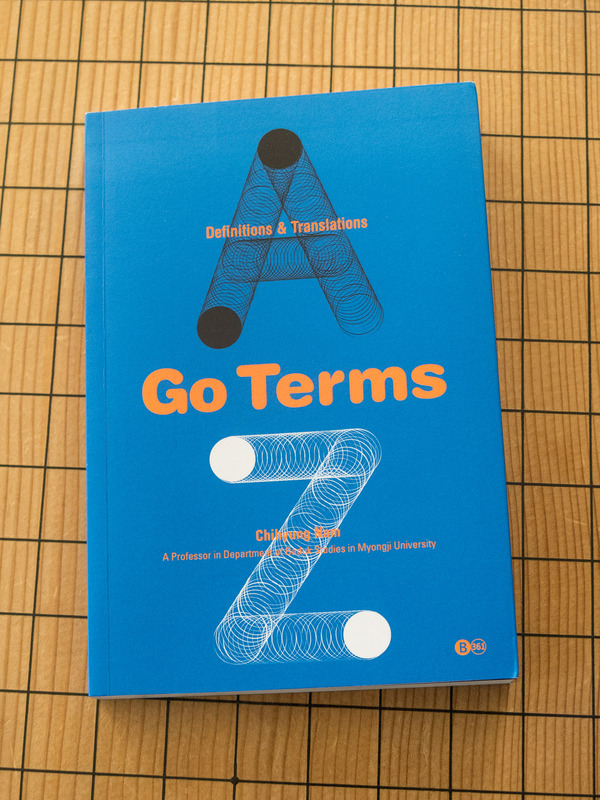 This is a great book for Seattle Go Center players, since it compares Go terms across four languages: English, Japanese, Chinese and Korean. 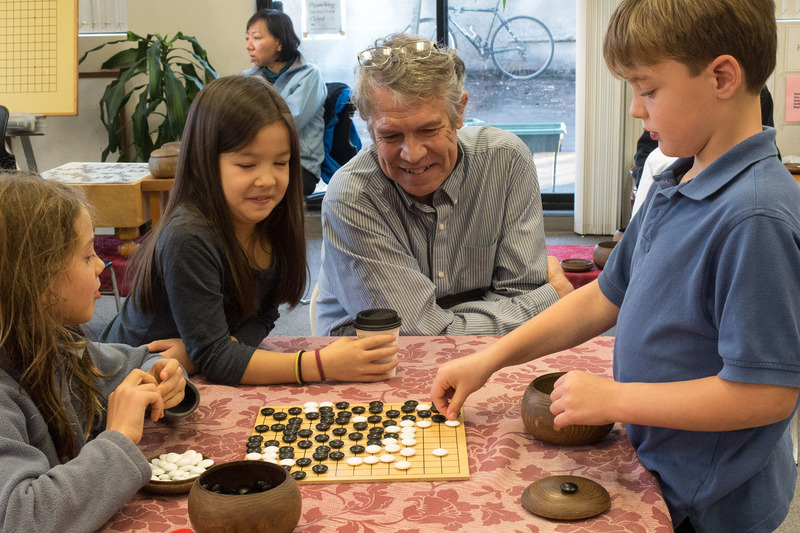 While English is the most common language at the Go Center, a lot of our stronger players use Japanese, Chinese or Korean as their first language. The book is organized for English readers, with explanations in English, and diagrams, and the corresponding Asian words, along with their Romanized versions. There are tables in the back of the book to help Japanese, Chinese and Korean speakers find corresponding terms in English. 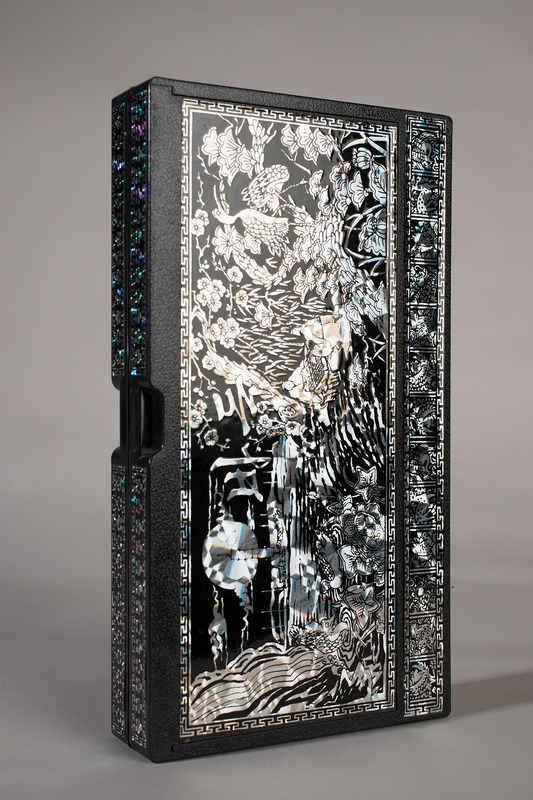 Readers will find that many Japanese terms are listed in the English columns as well, such as komi, sente and hane. In other situations, Ms. Nam suggests using English terms, which would make the game more understandable to beginners who speak English. So she uses “corner pattern” for joseki, and “play elsewhere” for tenuki. Often there is not an exact match across all four languages. The entry on “Continuous atari” includes a comparison of 7 Asian terms, including the Japanese oiotoshi, and the Korean chokchoksu. The party will be 5:00 – 7:30 PM. There will be Thai vegetarian food and Korean barbecue. There also will be several uncommon donated items at a silent auction fundraiser — two sets of Go postcards from the Nihon Ki-in, a set of Go stones in boxes marked with something that looks like Mickey Mouse, a “Picnic Magnetic Baduk” set with ornate decoration, and a few other items. Be sure to tell your friends who collect Go stuff! Here are some of the items that will be up for auction. 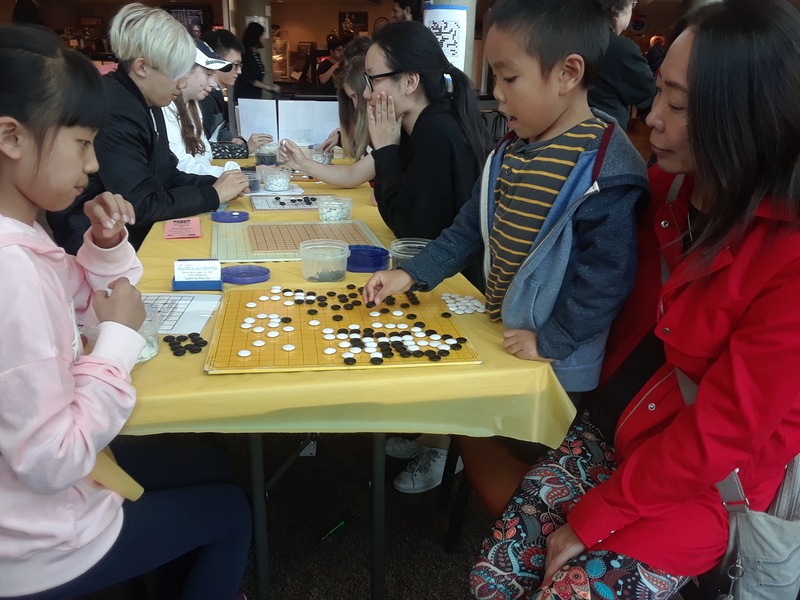 Sunday, October 7, 2018, the Go Center held a three-rounds tournament to celebrate our 23rd anniversary. 32 players attended, a quarter of whom have Youth memberships in the AGA! The “Open” section was limited to eight players maximum, all vying for the First Prize of $150 cash. 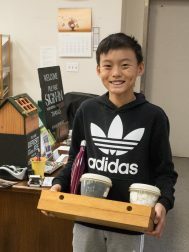 It was won by Alex Xinlei Liu 7 dan with a 3-0 record, who has been a strong contender here, even winning the Seattle Go Center Spring Tournament Open in 2017. Tournament Director Bill Chiles handled clock malfunctions and consequent pairing delays with aplomb, and Daniel Top stepped in smoothly to render assistance. 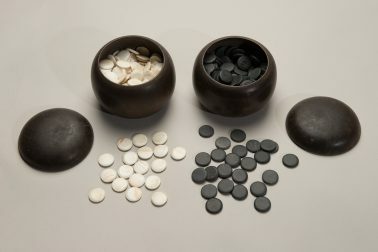 The twenty-four players in the “Handicap” section all had games with handicaps of 3 stones or less, and all but two games were at 2 stones or less. 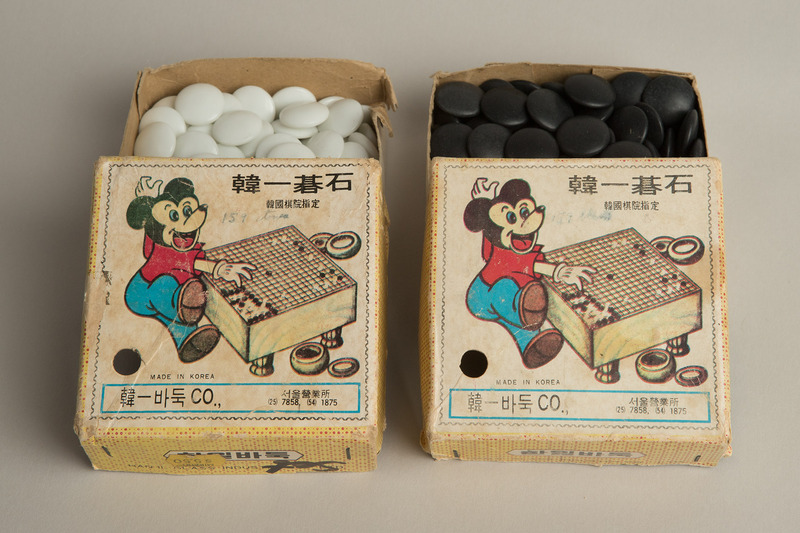 “Handicap” players who won all three of their games were awarded prizes of Go books and equipment. In addition, there was a cash prize for the Youth (under 18) player with the best win-loss record, which was divided among three Youth who went undefeated! Handicap Section 3-game winners: Yao, Zhihong (2 dan), Chen, Xiangnan (3 kyu), Brown, Frank (6 kyu), Lu, Lucas Wu (9 kyu), Schmitten, George (9 kyu), Lu, Yulissa Wu (10 kyu), Ling, Amy (15 kyu). Saturday, October 6, 2018, several volunteers from Seattle Go Center attended the Bellevue College Japan Week final day to demonstrate Go to attendees. From 10 AM to 5 PM, volunteers engaged with approximately sixty people, furthering appreciation of this great game. Thanks to the great volunteers — Rodney Deacon, Bert Ortiz, Yulissa Lu Wu, Keyi Zhou, and Kyle Burg!